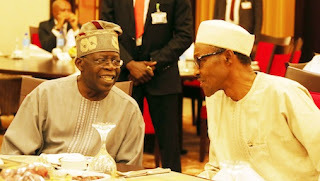 National Leader of the All Progressives Congress (APC) Bola Tinubu has denied claims that he has been making demands of President Muhammadu Buhari on whom the latter should appoint to his government. Speaking to State House correspondents at the Presidential Villa last night after breaking fast with the president, Tinubu said he respects Buhari and remains loyal to him. Ostensibly, the dinner with the president was held in furtherance of the peace initiatives by the ruling party to reconcile the warring factions in the National Assembly. APC lawmakers in both chambers of the federal legislature have been at loggerheads since the elections last month that threw up Senator Bukola Saraki as Senate President and Hon. Yakubu Dogara as Speaker of the House of Representatives, in defiance of the preferred nominees of the party for the posts. The former Lagos State governor said: “I have no demands. If you understand what party politics and leadership is all about, it is about loyalty and commitment to the values, which the leadership believes in. He stated that he was in support of what the president had carefully enumerated and articulated to the party on the issue, adding: “The party is supreme. The party must have disciplined leadership and followers. The party’s process must be respected because that is the confidence and the trust of the people. “However in every environment, we could have conflicts and conflict resolution mechanisms would be applied to resolve all the problems so we are there. 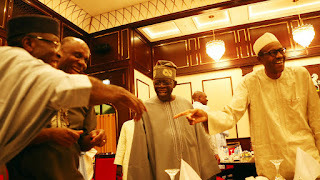 Tinubu also asked Nigerians to ignore the claim by the Peoples Democratic Party (PDP) that Buhari was too slow, adding that Buhari could not be expected to clean up the mess left behind by the PDP's 16 years of bad governance in 30 days. “We are different, we cannot be PDP, we are APC, we will not repeat their mistakes. We know their mistakes, errors, we understand what Nigeria wanted and Nigerians gave this party victory because of our manifesto,” he said. “We are pro-people, we are progressives. 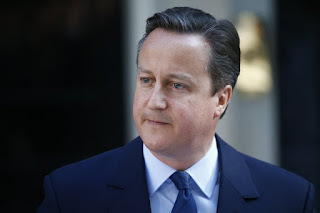 We have had a conservative government in the last 16 years, this is a progressive party, just coming in barely 30 days. “We understand the hopes of Nigerians, we understand the expectations of Nigerians, we believe in that expectation and in our promise of prosperity to the people. We will not change that,” he said. 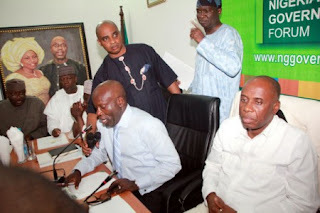 Buhari, during the dinner with the APC leaders, which also had the former Rivers State Governor Chibuike Amaechi and Publisher of the Leadership newspaper, Sam Nda-Isaiah in attendance, appealed to the warring members of the APC to reconcile their differences in order for the party to deliver on its campaigns to the ‎electorate. He also called on them to exert their influence both in the party and the country, in order for the party to achieve its campaign manifestos of addressing security, economy, employment and corruption. He recalled the difficulties the party ‎went through to emerge strong enough to dislodge the PDP, and asked the APC stalwarts to bury their differences and unite for the sake of the country. Buhari commended Tinubu for his support and words of encouragement, noting that it was important to reflect on their journey in order for them to appreciate how lucky they are as a political group.